Unstable consignors are the bane of this business. It seems that the consignor fantasized multiple nonexistent sales, complaining to everyone who would hear, that he had not been paid. So this is off the market, along with two other listed items, and multiple pages in progress will not be posted. So I wish Mr. Tanner well, and am returning all his consigned items. 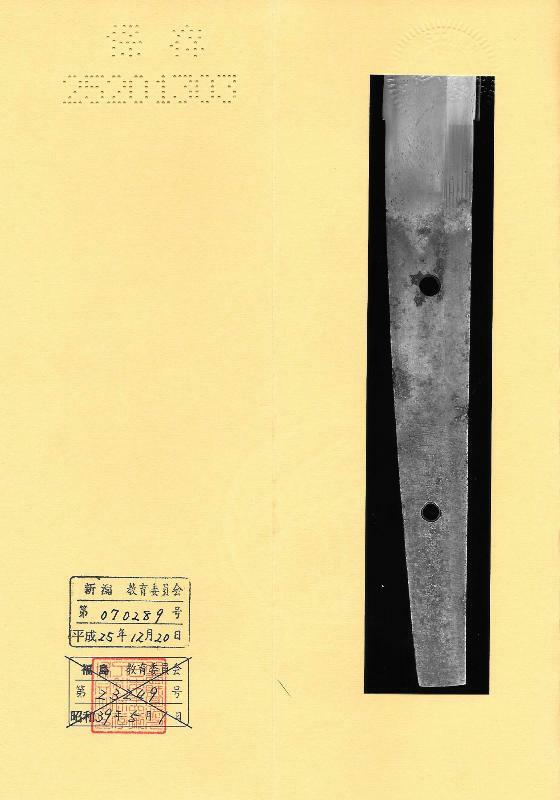 An o-suriage katana attributed to Sengo school. Shinogizukure, iroi mune, chu-kissaki. Hawatare: 2 shaku 1 sun 9 bu (66.36 cm / 26.13"). Motohaba: 3. 04 cm. Sakihaba: 2.22 Kasane: 5.6 mm. Gunome midare in a notare hamon, mirrored on each side. Ha nie and kinsuji. The itame hada has a blue hue and rough appearance, chikei. There is a weak areas in the jigane, and two small lamination separations. NBTHK Hozon kanteisho. Mounted in 19th century koshirae. Black leather tsuamaki over black same. The fuchi-kashira, koiguchi, kojiri, and kogaibashi are matching red copper with a texture of worn rock. The menuki are single mon. The kurikata and kaerizuno are matching red copper with incised vine pattern. The saya is textured black lacquer. The large red copper moku tsuba has puppies at play. 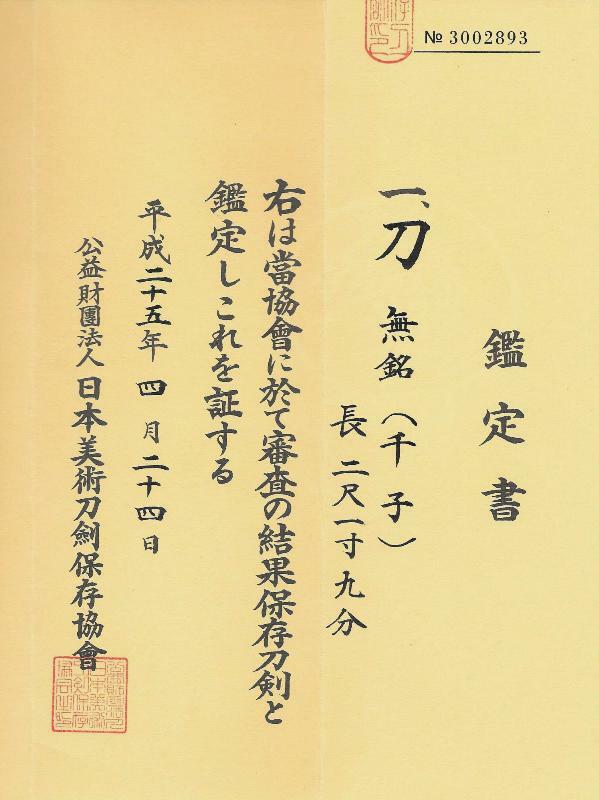 The Sengo school is a sub school of Mino, came out of the Kaneharu group in the fifteenth century. The premier artist was the second generation Muramasa.